When it’s your commercial vehicle—and your livelihood—on the line, don’t trust anything less than genuine Spicer u-joints! Discover the full line of Spicer u-joints engineered for the commercial vehicles you depend on. While engine downspeeding offers increased fuel economy and decreased emissions, the faster axle ratios needed to accommodate the lower RPMs result in additional torque in the drivetrain, placing much higher stresses on the main driveshaft, axles, and inter-axle shaft. The right driveshaft and inter-axle shafts with robust and durable components from Spicer can handle the added input torque with even greater reliability. Spicer Life Series u-joints – in particular, the SPL® 350—are engineered, tested, and proven to meet the torque demands being placed on drivetrains. Their exclusive design accommodates faster axle ratios without sacrificing life. 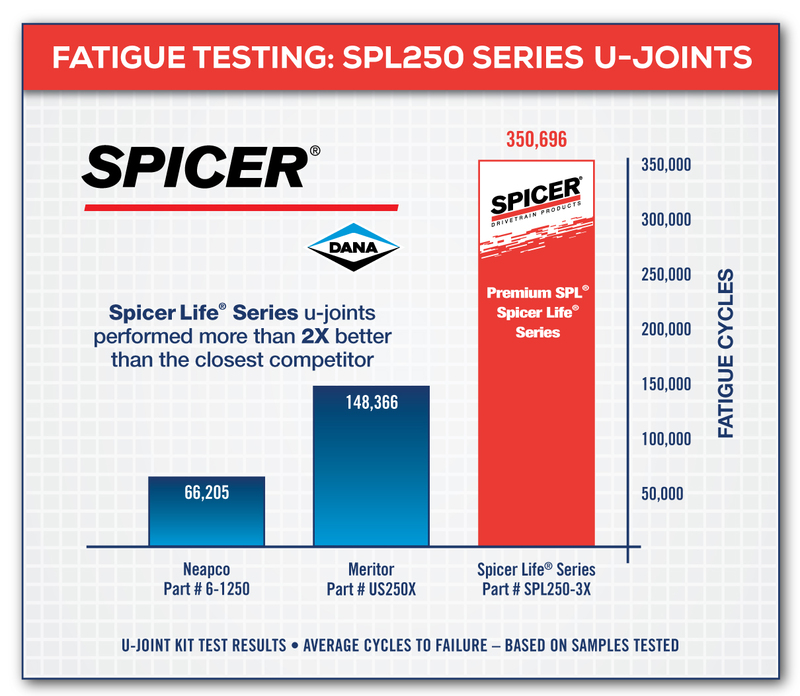 Spicer Life Series u-joints performed more than 2X better than the closest competitor! SPL 170 and SPL 250 universal joints are also available in service-free* options, which are lubricated for the life of the part. Permanently lubricated u-joints help keep your overall operation costs low while still offering the durability and dependability you expect from Spicer. Service-free* options are ideal for heavy-haul applications and are capable of meeting the requirements of future fast-axle ratios. * Inspections must be performed at each interval to check for wear, damage, or looseness that could affect lubricant life and lead to driveline failure. We do this by combining a computer-designed bearing plate with a patented manufacturing process that closely controls tolerances. It’s this commitment to exceptional design and production that has made Spicer the name people have trusted for more than a century. When it comes to torsional fatigue capability, the competition doesn’t even comes close to the Spicer 10 Series™ u-joint. These u-joints are consistently stronger, helping ensure longer life and better performance. Plus, zerks are positioned at 180°, so lubrication can be done without rotating the driveshaft. You save maintenance time and costs! 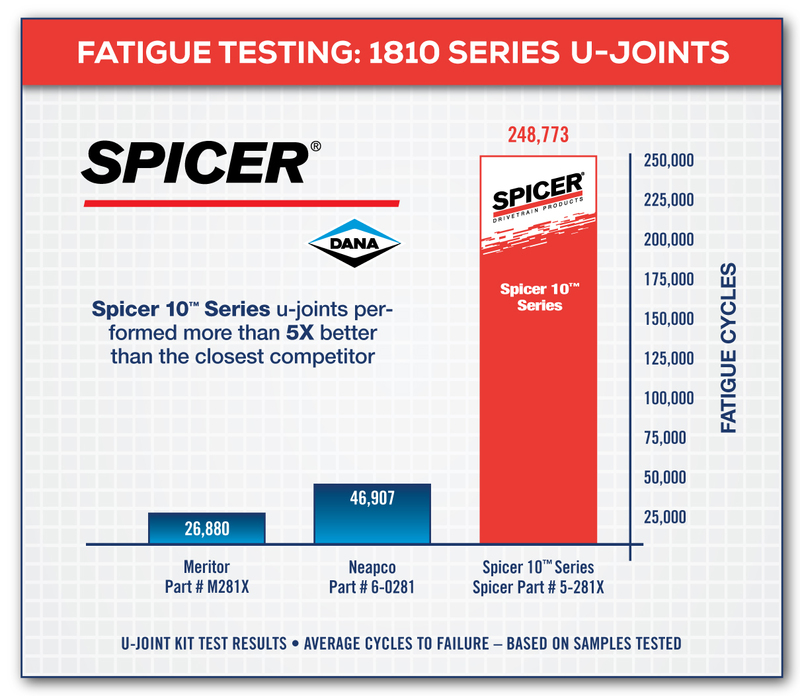 Spicer 10 Series u-joints performed more than 5X better than the closest competitor! For more information about Spicer u-joints, download our product literature. Then get in touch with your Spicer parts distributor and experience the Spicer advantage for yourself!